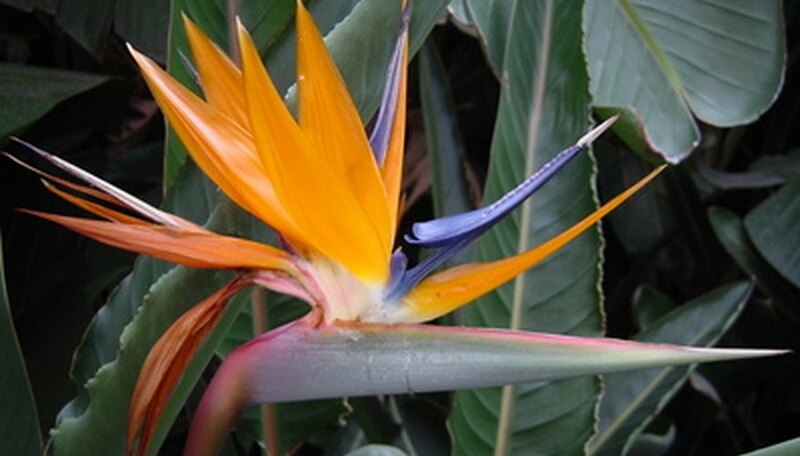 Bird of Paradise is a vivid, exotic plant named for the beautiful blue and orange flowers that resemble an exotic bird. This plant is widely associated with tropical areas, but it actually hails from South Africa. It is the official flower of Los Angeles and is appreciated in the United States for its ornamental attractiveness. Problems with the Bird of Paradise, however, can bring a halt to this plant’s exclusive beauty. Mealy bugs are scale insects with soft bodies covered in white, waxy powder. These bugs dine on Bird of Paradise plants with their sucking mouthparts and coat the plant with a sticky layer called honeydew. A black fungus then grows on the honeydew. Mealy bugs damage can merely cause the plant to look bad, or they can kill it altogether if left untreated. The sooty fungus is often the indication that mealy bugs are feasting on your plant. Treat mealy bugs by insecticides or other biological means. Some growers of Bird of Paradise opt to use the larvae of ladybird beetles to feed on the mealy bugs and eradicate them. A tiny, parasitic wasp called Leptomastix dactylopii can be used to feed on the mealy bugs in addition to the ladybird beetle larvae. If you opt for an insecticide, be sure to follow the label directions when applying the product. This is a fungus that causes root death and damage to the plant stem. Phytophthora can be caused by one of the many species of this fungus. You may notice that the plant stem looks peeled or scaly. The top of your Bird of Paradise may also show symptoms of this problem. It may look droopy or discolored. Overly wet soil is a leading cause of this fungus. Prevent this problem with your Bird of Paradise by taking care to not overwater. Spider mites are common pests among houseplants. They range in color from red to brown and are hard to see with the naked eye because of their small size. Spider mites attack the leaves of the plant and feed on the sap. This causes bruising and discoloration, and can give the Bird of Paradise a bronze or gray look. The plant leaves can become scorched and begin to drop. If not treated, the plant can die. Treat and prevent spider mite infestations by using a pesticide to kill the insect. Always follow the manufacturer’s directions when using an pesticide.